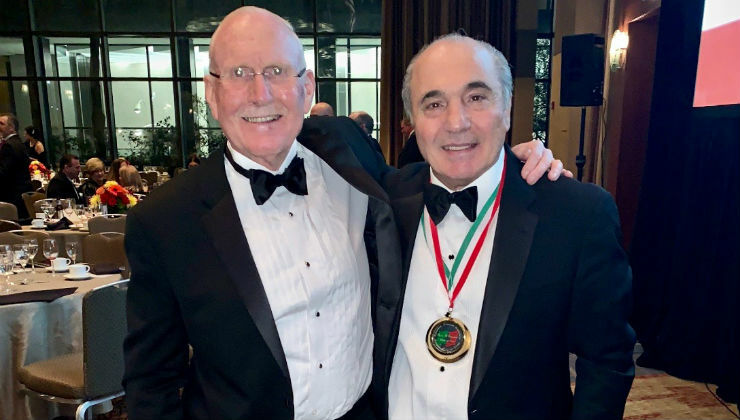 Outside of the man's wife and family, perhaps no other person was pleased or proud to see New York Cosmos owner Rocco B. Commisso get inducted into the National Italian American Sports Hall of Fame than Len Renery. Renery was present when Commisso pulled off some heroic performances for Columbia University decades ago and he was there when the Italian immigrant was inducted into the Hall in Chicago earlier this month. "I'm pleased for Rocco," Renery said. "What impresses me more and more is all of the things he's done. A lot of people come from traditional schools and companies and feel like a part of them. There were not many of them that support [colleges] in that way. I look out at Baker Field [at Columbia University] and see what Rocco did." Commisso has donated millions of dollars to his alma mater over the years. 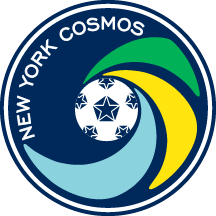 The soccer stadium is named after him as the Cosmos B team has played there the past two National Premier Soccer League seasons. "What impresses me about him the most always is that he gives scholarships to high school students to get an education and give them a future," Renery said. "That's all on him. He does it quietly and behind the scenes." Commisso invited his former teammate to attend the gala at the Hyatt-Regency in Chicago "because we were co-captains and I want your support," Renery said. The Cosmos owner was enshrined alongside former New York Yankees manager Joe Girardi, MMA legend Gina Carano and Illinois high school basketball coach Gene Pingatore. Joining the celebration were some of America’s most recognizable sports personalities, including Tommy Lasorda, Ray “Boom Boom” Mancini, and Mike Piazza. "The company that he's with, wow!" said Renery, who mentioned some former inductees, including Yankees great Joe DiMaggio and ex-Yankees Billy Martin and Joe Pepitone. "The list goes on and on. I couldn't believe the number of Italian fighters that were in that Hall of Fame. I thought it was unbelievable company. It was a terrific event." Commisso's speech included his background and his family. "Rocco's speech was good," Renery said. "The point came across that he was very, very fortunate to come to this country, that he's worked hard. It was family. Every speaker up there spoke of family. The family of the teams, their own immediate family and how some of the guys; Joe Girardi was talking about how nobody would ever come over to his house or his grandmother's house and there wasn't a piece of cake there or a glass of wine. The nature of the Italian heritage really came through that whole night. It was awesome. I thoroughly enjoyed it. I had a great time." As a Columbia soccer player, Commisso forged a reputation as being a battler on the pitch, having a never-say-die-attitude. In fact, Renery remembered a game that defined his former teammate. It was bitterly cold day in Buffalo, N.Y. when Columbia University made its first appearance in the NCAA Division I men’s soccer tournament against Buffalo State on Nov. 19, 1970. Buffalo State was so confident it was going to win and advance to the next round against Hartwick College, it booked hotel rooms at a downtown Oneonta, N.Y., motel. Columbia, however, had other ideas, although the Lions did not get off to a good start. In the third minute Randy Smith, a future National Basketball Association star, slotted home a rebound for the hosts. Before the first quarter — college games were played in quarters back in the day — ended, Commisso, a senior and co-captain, took the game in his own hands, or more appropriately, his feet. Quite appropriately, Commisso became the first Columbia player to score a goal in the NCAA tournament. The Lions prevailed after four extra-time periods, being awarded the win after recording more corner kicks in the extra periods, 1-0 (yes, those were rules in 1970). And not surprisingly, that goal helped define Commisso in so many ways, as a goal-getter and a go-getter. He built his business, Mediacom, into the fifth largest cable TV provider in the country. “Rocco was strong as a person, as a player,” said Renery, who had a 10-year pro soccer career in the United States, including two seasons with the original Cosmos. “Rocco was intense as a person and as a player and he was good enough skill-wise or soccer-wise that he started every game. I don’t remember Rocco not starting, didn’t care what position he played. And today, Commisso is a member of the National Italian American Sports Hall of Fame.